Imagine you’ve got one arm tied behind your back to help understand what the daily life of an amputee feels like. How would you squeeze toothpaste out of a tube to brush your teeth? 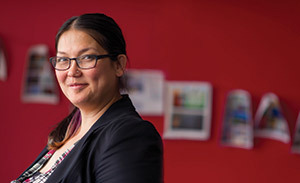 Assistant Professor of Design Ann-Marie Conrado’s first- and second-year course Design Matters, a gateway course to the Department of Art, Art History & Design’s new Collaborative Innovation Minor, considers questions such as this and looks for solutions. Design Matters is divided into three primary areas of focus: insight, ideation, and implementation. During the insight stage, students work to identify and understand a problem by researching users, their needs, and the context, developing empathy along the way. In the second stage, they generate ideas and rigorously evaluate each one. The last stage is implementation — how can the idea for a product, invention or service be brought to life? In previous semesters, students in the course have collaborated with various commercial organizations and social entities in the U.S. and abroad. Conrado, born in Las Vegas, is a 1993 BFA graduate of Notre Dame. After working as a product designer (“burned out and working really long hours”), she decided to spend a year traveling the world and fell in love with Nepal. Her nonprofit organization, Hope for Nepal, is an international group working to utilize design thinking to address humanitarian concerns in developing countries. In addition to scholarships for education in Nepal, the group established Hope House, a home for orphaned children in Kathmandu, and the Design for Fair Trade Initiative, which teaches crafts for the creation of fair trade products — both for sales and to continue the country’s crafts heritage. Nepalese handicrafts are sold on campus every year at Badin Hall’s Conscious Christmas event. Since a magnitude 7.9 earthquake devastated Nepal on April 25, 2015, the focus has been on rebuilding efforts — Notre Dame MFA student Kevin Phaup, she notes, traveled to Nepal to develop a template for a shelter that utilizes local materials and is designed to be carried by a single person. The minor in collaborative innovation will launch in fall 2016, offering students an opportunity to engage in process-based, cross-disciplinary learning across University departments. 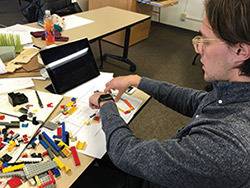 Students begin with an introductory course, Design Matters, which uses lecture- and case study-based learning followed by hands-on exercises and team projects. Declared minors then take an additional four courses introducing them to skills in areas including research methods, visualization and entrepreneurship. The program culminates in a fifth capstone course, Collaborative Product Development, which brings the students together with design majors. Working in teams with corporate partners, students have the chance to solve a variety of real-world problems.